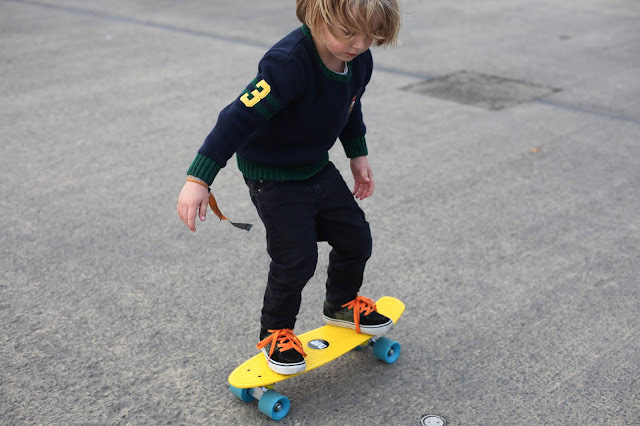 I was always into alternative sports when I was growing up spending lots of weekends at the beach, surfing for hours on end and when the surf was flat then you could find me cruising around on a skateboard in the summer sun. A few years ago I damaged my knee, had surgery, recovered and shortly after had my eldest son which has not left me that much time to get back on the board although with Mr A now showing an interest in learning it's really exciting to get back on a board and encourage him to do the same. So when Plain Lazy got in touch asking if we would like a go at one of their super cool and colourful retro boards we literally couldn't wait for it to arrive. 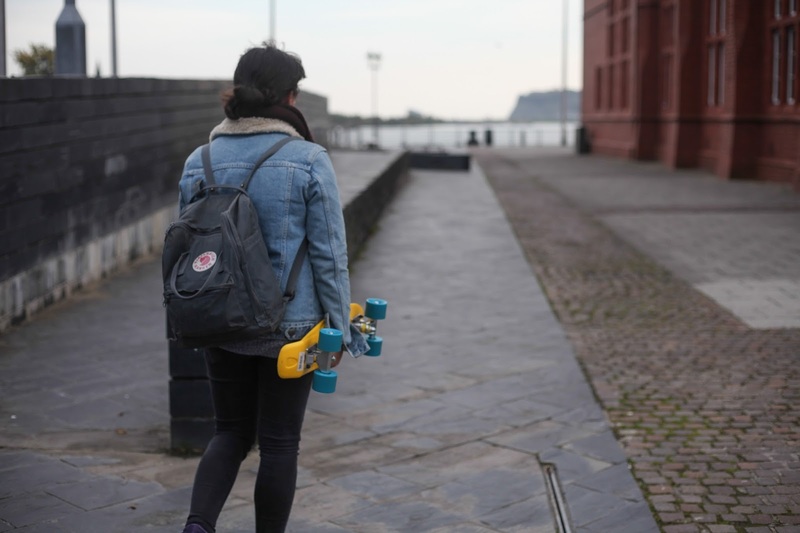 Penny boards as they are more commonly known are great for learning the basics and with large wheels and Abec 7 bearings for a smoother and faster ride they are great fun speeding along a promenade. You can also choose your colour combination of wheels and deck, we went for yellow and blue. 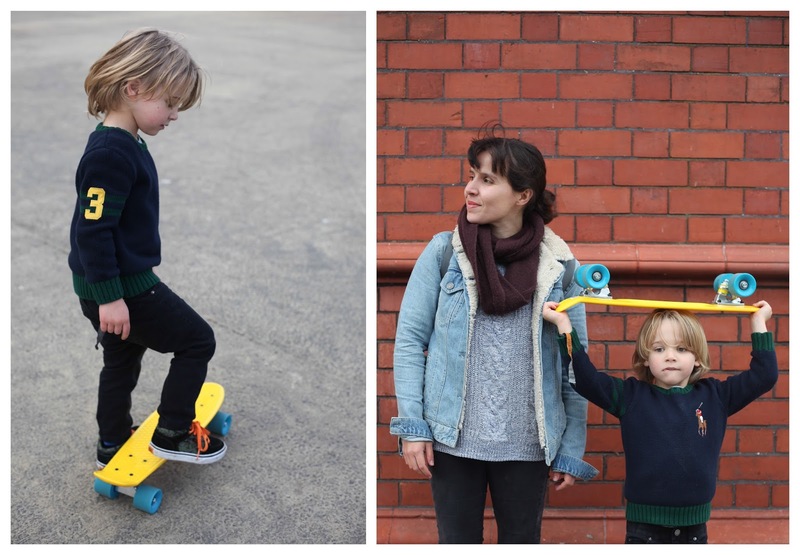 The quality of these boards are excellent and would make a fantastic gift for all ages this Christmas, including you mamas! I was really surprised how quickly Mr A picked it up, he has been on my full-size deck before but not recently and under my watchful eye he made some real progress. They are also pretty small and light making them great for on the go. Once my son is more confident we will get another one and keep them on hand for nipping around the city or park. These really are a lot of fun and we are looking forward to another dry day to go cruising. Thanks to Plain Lazy for sending us this super cool retro board. Amazing! I want to see more videos! I think my kiddies would love the board!!!!! Such a fun post. I tried skateboarding when I was younger but was no good. I was really into rollerblading! This looks so cool. The only time I ever got on a skateboard I fell right on my arse!